I’m proud to announce that my new book, “I’m Not Broken: You Don’t Need Arms to Be Happy” is finally out! This book has been tons of fun to write as I was able share some of my life’s lessons on how to truly be happy. I learned at a very young age that my happiness could not depend on what I had or did not have, so I’ve spent my life making sure that my happiness comes from within. In this new book, you’ll learn my secrets on how to live life more abundantly, and how to truly be happy in any situation. I invite you to head to the All He Needs for Heaven store with the link below, and pick up a copy today. Not only do I promise a fun and engaging read, but you’ll also be helping our ministry with your investment in this guide to happiness. 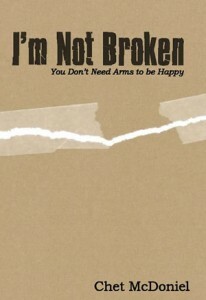 Purchase I’m Not Broken: You Don’t Need Arms to Be Happy!